Summary: The best Battlefield Hardline hack with over 40 amazing features including super jump, aimbot, full ESP, no recoil, no spread and much more. FPSCheats is the only site offering exclusive features that keep you undetected. 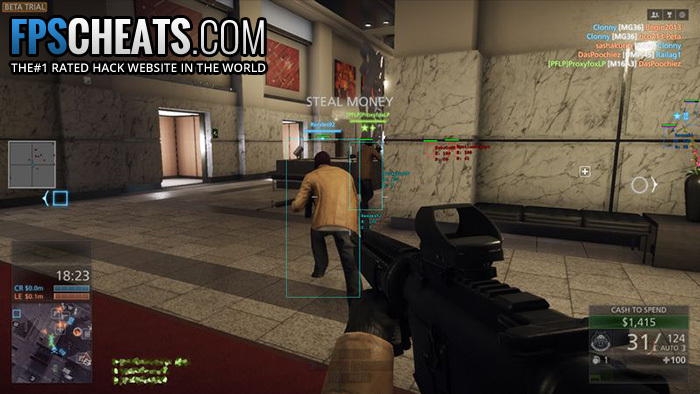 Do We Have Battlefield Hardline Hacks? Yes, we do, we had one of the first ever Battlefield Hardline Hacks released for the alpha, beta and now we are working for the full release that’s coming March 17th. Our coder has been working on Battlefield games for over nine years; we released the first ever Battlefield hacks for BF2142 back in 2006. When you get a membership with us at FPSCheats, you’re working with the company with the most experience, so register on the forum now to get started. If you still need to buy Battlefield Hardline you can download it now for early access and extra goodies! Check out the Battlefield Hardline video trailer below showing off actual game play. How Do BF5 Cheats Help You During Multiplayer? When you use any of our cheats, they will help you win every round, get more points and unlock more items faster. When you play legit, it takes you more hours to get good enough to start winning all the time. Why waste so much time? Simply start our cheat, start BF5 (Hardline) and everything is already up and running. Even if you are one of the best players on the servers our cheat will make you better, we guarantee it. Check out the exclusive new fly hack we just released, simply fly up in the air and land at the other end of the map. You can also get to locations other players can’t reach, it’s awesome! Think about when you usually play on a map like Dust Bowl and all the dust starts flying, you can’t see a thing. We are removing the dust and smoke with our hacks, and we mark every player with a bounding box (or BB) that also helps spot each enemy player. You can always see everyone, anywhere at any time, even if they are hiding behind objects. When you can see everyone, you can plan ahead, surprise the enemy with a fast kill and get away with stolen loot or money faster. You will be playing the game like someone who has super powers! How Does the Battlefield Hardline Aimbot Work? Some people don’t like to use our Aimbot while others just can’t stop using it. Aimbots simply help you aim and keep you locked onto the enemy as long as you press the aim key. This type of cheat is helpful for people who have a hard time aiming and killing other players in the game, or for people who just want to rage kill and win with over 100 kills. All you do is setup your aim key by pressing any keyboard key or mouse button using the in-game menu. When you’re playing on the game server, you can always see the enemy with boxes around them called ESP. Look at the enemy you want to kill, press the aim key and the weapon locks onto that enemy player. If they duck, jump, run or try to get away it won’t help, you stay locked onto them. Then you simply press the fire button and take them out. The Aimbot works great when you use any weapon. However, the sniper rifle is my favorite. I love to kill people from 3000 meters away. You can also lock onto players in helicopters or vehicles and take them out with one shot. So grab a pistol, hit the aimbot key and take down pilots with ease. Once you kill a player, the aimbot will instantly find the next target for you and lock on again. You don’t have to move the mouse or aim at all. Simply keep the aim key pressed and you can get kills as fast as you want. I do recommend using human aim, so it looks like your not cheating, but some people just want to rage all day and kill as many people as they can, so rage kill or look legit it’s up to you. Battlefield Hardline doesn’t have a system where you run around the map and pick up new weapons. You work on a progressive system where new weapons, items, add-ons, outfits, etc. unlock based on a point system. The more people you kill, the more loot you steal and the more areas you catch depends on the amount of cash you end up earning. When you come in first every round you score anywhere from $10,000 – $30,000 cash! The extra money allows you to unlock weapons, add-ons, all items, and more. Using cheats allows you to get more money and points than anyone else playing the game. You can unlock all weapons, skins, items, and outfits before anyone else, so you don’t need to spend weeks or months trying to get all the unlocks. Can the BF5 Cheats Get Detected? We have over nine long years working on Battlefield based games and more experience than any other website. Your CDKEY and player will be safer longer than if you selected another website or even try free BF5 hacks. Our last game hack (Battlefield 4) hasn’t had one detection in over two years! When you get VIP with us, you get over ten years of experience! Plus we have been coding hacks for Battlefield related games from the start, back with Battlefield 2142 and we continued with BF2, BF3, and BF4. So your game, CDKEY, and player will be safer with us, in the long run. Any website can get users banned eventually, but we have a track record of keeping users safer the longest. The problem with free cheats is the developers or anti-cheat team download them daily and crack the cheats to view the code. Once they look at the code, they place signatures in the anti-cheat program and detect you, even if you just start the cheat you can get detected and banned. Meaning you lose your CDKEY, player and all the work you did in the game. When you use other websites with paid or VIP cheats you need to make sure they have enough experience. Some websites opened up a year ago or less and just use copied features and code from other sources. They want to make as much money as they can and don’t care about bans. So pick a website with plenty of experiences and a good track record. 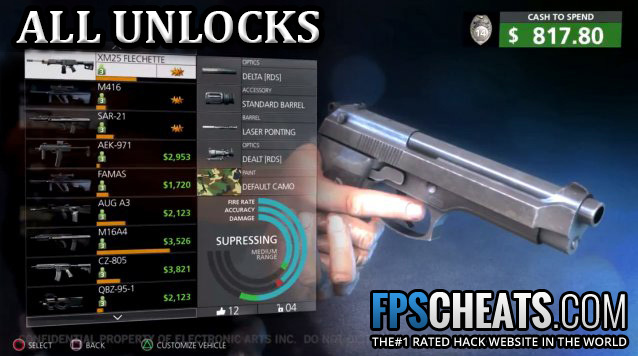 How Many People Use Battlefield Hardline Cheats? In a recent survey completed by a larger game magazine they found that over 80% of PC game players have used cheats or hacks before. Ever wonder how you can be hiding behind a wall and some guy pops up and kills you in seconds? What about when you come to a corner and some guy pre-fires and kills you before you can react? Ever seen someone that had an outrageous score with like 70 or more kills when everyone else had far less? These are all hackers, and they are in every first person shooter game. So if you never tried hacks before, please try it and see what you’re missing, you won’t be sorry. 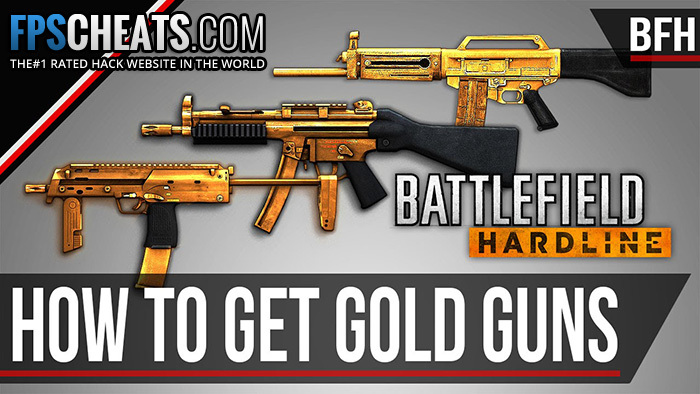 You can see the gold camo colors below to get an idea how they look. 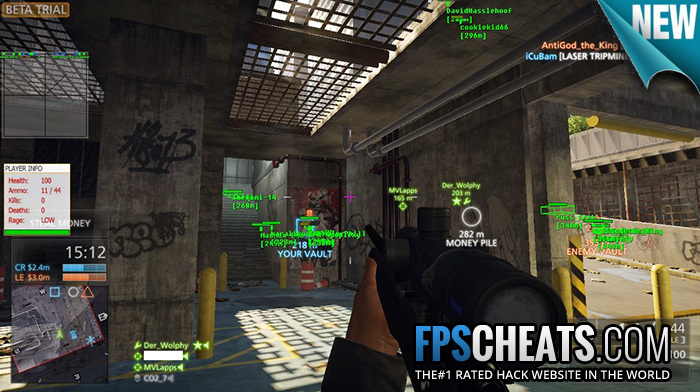 So if you want to download our Battlefield Hardline Hacks register on our forum, then you instantly get access to our private VIP section. Once you get VIP, you can start using the hack in seconds once you start the game. If the game is ever patched or updated, we fix it and put a new release out ASAP. We also add new features free of charge to you when you become a VIP. Is Battlefield Hardline Gameplay with Cops and Robbers Fun? I’ve played both the Hardline alpha and beta and the game is getting more fun with each release. If you compare the game to previous Battlefield games, you’ll notice it’s no longer military vs. military, it’s now Police vs. robbers. People were complaining about this when they first found out but now the games fun as hell to play. The developers put in more weapons; more unlocks, upgrades and gadgets than ever before. So if you want the best new Battlefield game in the world you really should try Hardline. The game actually had more testers than Destiny did, so far 8 million have downloaded and played the beta. The only thing I noticed in Hardline that needs tweaking is the sniper rifles. I had no problem hitting the enemy from and over from 1000 meters out. I was also able to keep firing fast and kill about five guys in a row; it was pretty funny. Right now, it seems like the sniper rifle or “Professional Class” is the favorite. Check out the screenshots below and look how good the game looks in high resolution. I also played for about 25 hours with no bug, rubber band or lag issues of any kind (maybe they learned their lesson) and this release won’t be as buggy as previous Battlefield game releases? A great feature in Hardline is the ability to use the melee attack on the enemy players. But this new BF game has tons of variations that most people don’t know about yet. The knife, bats, etc. all do different melee attacks depending on how you approach the enemy and what stance the enemy is currently using. Watch the video below and check out all the different knife attack animations when the enemy is prone, kneeling, standing, etc. You’ll also notice the attack changes if you attack from the front, back or sides. The video below explains what all the grenades and gadgets do in BF5. You can watch the video and quickly learn what you want to unlock and pay cash for when the full game gets released. My favorite unlock the “Stunt Driver” gadget unlock, it will add nitro boost to your vehicle and the vehicle will take on less vehicle damage. I've been using the BF Hardline hack for about three weeks and I simply love it. It comes with 40 or so features including super jump, where you can jump and get on top of any building you like. I also use the aimbot to lock onto any enemy and always win. The site is legit and easy to use. I finally decided to try the Battlefield Hardline hack and I simply love it. This is the only hack that allows you to super jump and get to places other people can't access. It also has a full vehicle and weapon aimbot, I give this a 5 out of 5.